I have no control when it comes to Beauty and the Beast merchandise--and this is not connected either to the new film (which I haven't seen and can therefore not want merchandise for until I see that I like the film) or to the animated film. It's just in general. Even when Tarte called an eyeshadow palette "Beauty and the Box," I had to get it (I mean, it's also a great little eyeshadow box that I still use regularly). And of course, so far most of the merch that you come across has been associated with that 1991 film. Right now, however, there is a renewal of merch in general because of the new movie--and so I'm using this as an opportunity to, um, buy what I can while it's all around. So that's how I came to get this little yellow book. Strictly speaking, it is merchandise specific to the new movie (which I said I wasn't getting, or at least not for now). You can see the new designs for Mrs. Potts and Cogsworth there on the cover. But it isn't really a movie book, so I allowed it. 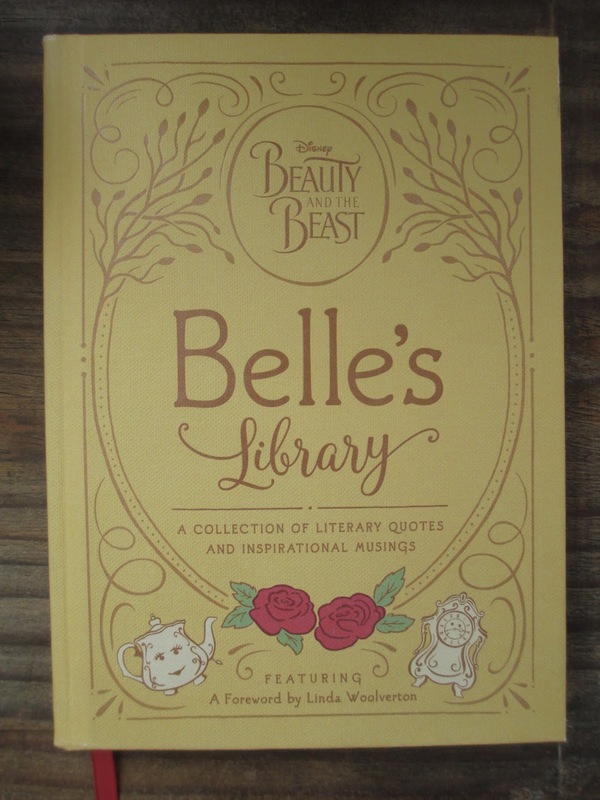 Belle's Library by Brittany Rubiano with art by Jenna Huerta is what you'd call a coffee table book or a gift book. On the left side of an open pair of pages is a quote from literature and on the right side is Belle's brief commentary on the quote. So if you just flip through it, it's very simple--it almost might not even seem worth it, or at least not worth buying except for a pretty cover. But once I started reading through, I was impressed. First of all, these aren't just a random collection of quotes. They are all taken from a select number of books and these are all books that Belle could have read because the most recent one is from 1726. Gabrielle-Suzanne Barbot de Villeneuve published her version (also the oldest version) of Beauty and the Beast in 1740. So, it's nice that they took care of this small but significant detail of historical timing rather than include books post 1740 that perhaps more people are familiar with. You have to be a literary person to be familiar with all of the works that are alluded to in this book. We've all heard of the basics in here, like The Odyssey, Romeo and Juliet, and Aesop's Fables. But there are also some more obscure works in there, like The Blazing World by Margaret Cavendish and Oroonko by Aphra Behn. Or simply things like The Canterbury Tales that literature students have probably been forced to read at least in part but that most people probably haven't read or read through (I really don't care for it enough to want to read it all). So from that sense, you'll come across a couple of famous quotes or passages, but you're also getting a lot of new (that is, less used in modern times) material from some rather dense sources. So that makes this an interesting volume. Now, the quotes are always small, as are Belle's comments. So this isn't something where you have to have a doctorate in middle English in order to read it. Someone as young as ten years old can enjoy this book (yes, some younger, but ten sounds like the general age). Belle isn't really providing analysis of the quotes; she's just commenting on what they're saying or what they mean to her. So she is more acting as the narrator, guiding the reader toward what we're supposed to be thinking. And what we're supposed to be thinking is, of course, the plot of events of Beauty and the Beast. Quotes, then, aren't randomly placed. There will be a couple of them in a row that refer to a certain subject, like hospitality or love. Each subject builds off of the next so that the quotes are telling you, through ideas and themes, the story that we all know. It's a nice effect, and it was surprising to me that this book does read through from beginning to end rather than simply being a loose collection of unconnected quotes. It's also a very pretty book. I mentioned that the cover is nice. The pages are just a fairly standard white paper, but along with the quotes are little pictures or borders. They're supposed to be Belle's scribblings and sketches. So it looks like they've been watercolored in; there are even small watermarks of color from when the paint is meant to have splashed or bled. A simple style reminiscent of Beatrix Potter. Very nice.